When SHOP CATS of New York arrived at my home, I was immediately taken by the cover. It is intriguing, gorgeous and captivating. I thrive on tactile and visual stimulation. The book is hard cover, (it even FEELS good! ), printed on high quality paper that does justice to the magnificent photos. Like a cat cannot wait to climb into a new box, SHOP CATS of New York became MY brand new box, and I couldn't wait to jump in! A book that features two of some of my favorite things in the world, Cats and New York, written by one of my favorite cat bloggers whom I have followed from way back when I first began blogging, Tamar is PURE (or "PURR") NEW YORK! Quirky, animated, artsy, unique, a trend-setter, full of passion and enthusiasm for the cats, people and life in the city that she loves, NEW YORK. I knew this was going to be GOOD. I was NOT disappointed. It is BETTER than "good." It is a must have for anyone who loves New York and cats and is curious about cats who reside in shops, and for those who love superb photos of cats that you can gaze at daily, it is a "whack-yourself-on-the-side-of-the-head-saying-why-didn't-I-think-of-that?" kind of a book, a "PURR DELIGHT." 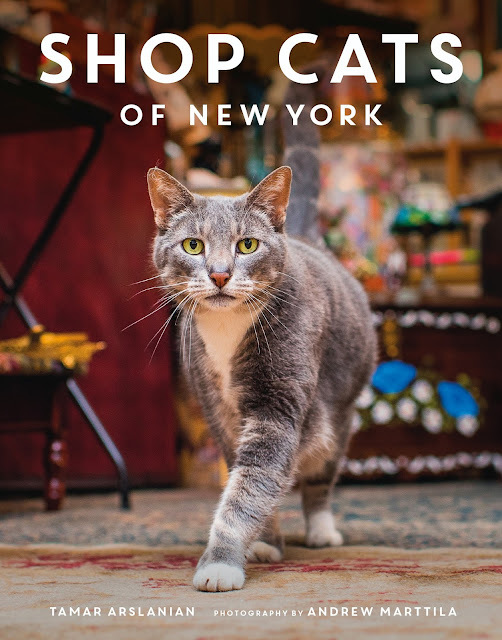 FROM THE PUBLISHER:Shop Cats of New York introduces forty of New York’s favorite felines—all who have an extraordinary story to tell. Popular cat blogger Tamar Arslanian and Instagram pet photographer Andrew Marttila capture these deeply loved and well cared for animals in their city habitat and reveal how they came to reign over their urban kingdoms. Photo Courtesy of Shop Cats "Lionel"
I was born on Long Island, NY and both of my parents were from Brooklyn. I still have family there, I have friends there. New York is a place that makes you come alive, it is a place where I feel that with my boisterous and loud personality I don't stand out, I blend in. I feel at home there. But what about these cats? How were they discovered? For Author Tamar Arslanian, resident New Yorker and cat lover. It was "only natural" that she noticed cats wherever she went. 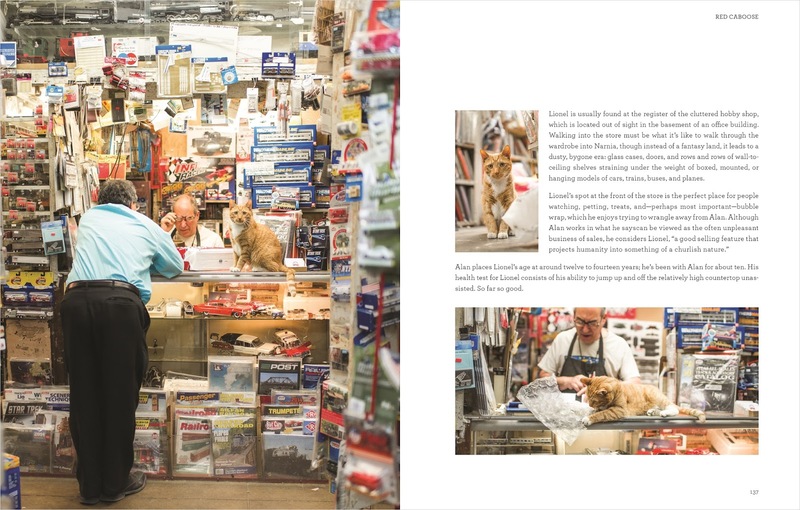 As she started meeting cats in various shops around her neighborhood she became curious as to where she could find others throughout the city. After doing some research and meeting superb photographer, Andrew Marttila "at a cat event-where else?" SHOP CATS was born. whose owner is highly allergic to cats, a wine store cat with his own chiropractor, (he has a bad back), a cat who is a the mascot at a dog boutique." Any many more!!! Photo Courtesy of Shop Cats "Bobo"
Of course I HAD to feature "Bobo" shown above (since my first cat and "soul kitty" was named "Bobo"). The Bobo featured above resides at JAPAN MARKET INC., Chinatown, Manhattan. Lest you think that the cats in these shops are merely used as "mousers" and not cared for, think again. That couldn't be further from the truth. The cats often get more mental stimulation and love than cats who are in a traditional "home" environment. 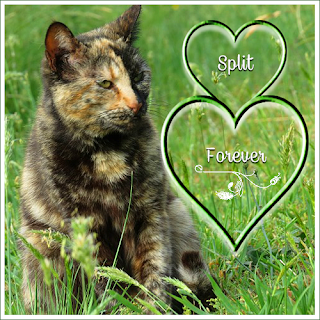 They have customers who visit them regularly, who "oooh" and "ahhh", whisper sweet nothings and caress sweet kitty faces more than we might have time for with our cats at home. They have all they could hope for, and then some. Most importantly they are LOVED. 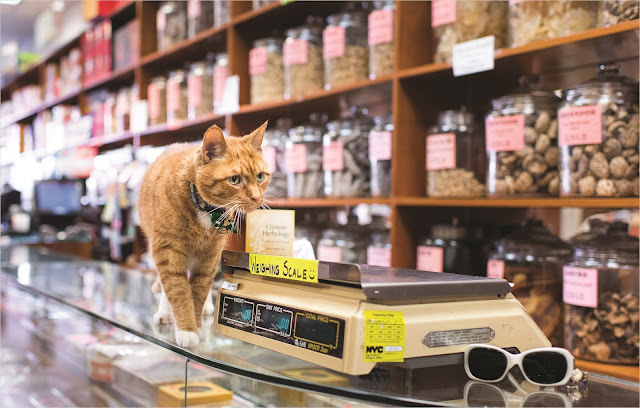 As a result, SHOP CATS of New York hopes that shelters in their area will consider allowing more businesses to adopt cats, and that the myth that cats who reside in businesses are strictly used to control mice and insects will be dispelled. 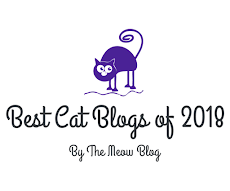 Years ago before I had a blog, I remember stopping into a Bird Seed shop with a resident kitty, as well as a cat boutique (that has since closed), that had cats regularly strolling in the shop on a daily basis. 99.9% of the reason I even visited those shops were because of the "shop cats" who "worked" there. It makes me wonder, could we be looking at a series of books featuring cats located in various cities around the United States and the World popping up???? Tamar and Andrew, are you listening? We can only hope!!!! and wherever you purchase your books! I was not compensated for this review. 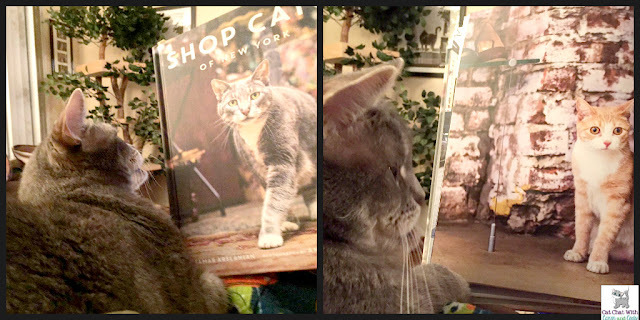 I was sent a complimentary copy of SHOP CATS in exchange for my always honest review. We are SOOOO getting this book! It is a gift for any cat lover this Christmas!! We have this book too and LOVE it! I think there should be a shop cats of L.A. book... my human could work on that. Thank you!!!!! That is so cool that you introduced Tamar and Andrew! I didn't know! That is so cool! SO excited for this! I hope it does turn into a series. Me too! wouldn't that be great? That sounds like a great book for cat lovers. I'm bias but I think it is! ���� I hope you check it out! You won't be disappointed! Thanks for the support! Thanks so much and I agree. I wish that more places would "emply" cats too! Yep you got it! Those cats are fussed over oftentimes more than our kitties at home! 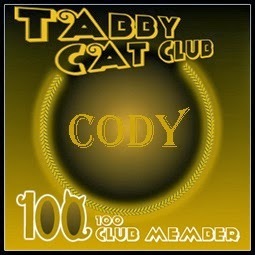 I am like you, as I mentioned in the review, there were two places I shopped at just BECAUSE there was a cat there!! Agree! It gives a place so much warmth as they do to our homes! I do hope you check it out! It's a great coffee table book and makes a great gift! Of course I am a bit bias! lol! What a fun review! I enjoyed this book too... Have only been to New York once, but this book made me want to hop on the train and go back! Thank you!! OMG you have only been to NY once? You MUST go back!! This book looks wonderful- all shops would be enhanced by the presence of cats! Nice review, Caren and Cody. So nice to hear your sentiment! I wish more rescue places could be more open minded - just like with private residences, you can't assume! Thanks for your thoughts and yes Caren did a lovely job with her view! What a fun read this will be. Too cute. I linked this post to Awww Mondays. Love Caren's review and thank you so much for sharing it!!!! We can use all the sales we can get! 👍 Thanks for the love! This looks like such a fun and gorgeous read! The photos look truly phenomenal. There are a couple shops in my area with kitties, and I love when I get to visit with them. I've always wished there were more shop cats in my area. Honestly, all it would take for a shop to get more of my business would be to add a shop cat. 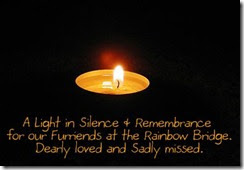 Thank you for sharing this, Caren and Cody! We will definitely be checking it out! Oh it is and the photos ARE "truly phenomenal!" it is an interesting read too, learning about the cats and their back stories. I think more shops should have kitties and I would go there too! You are most welcome!! Caren did an amazing job - love the review! I'm so happy with how the book came out and i do hope you check it out!! Share with your kitty loving friends! Thx!!! That looks like such a terrific book and we are so excited for Tamar! It is! She did an impeccable job with it. It is just gorgeous and we are excited for her too! TW knows ALL the shop cats around here. She was hoping Tamar would feature P-Kitty and Felix but she just wanted NYC shop cats. There are more too. 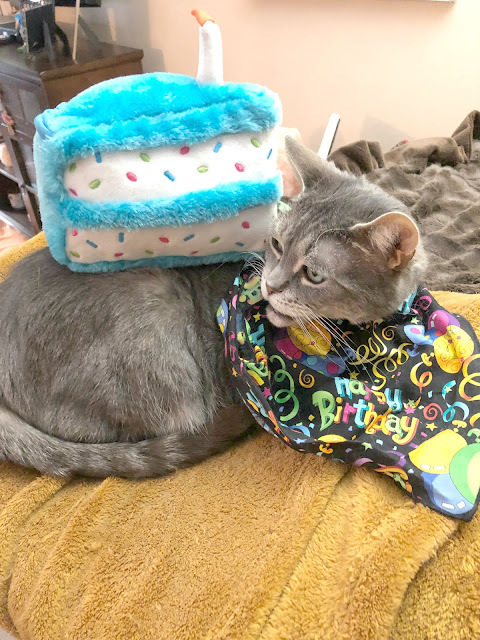 Right now there's a big to-do cos some bi-atch complained on Yelp about on of the NYC shop cats and said she'd no longer frequent a store with a cat cos it was unsanitary or something. She had to delete her comment cos she got so much hate mail. Geeze...there is always a kill-joy in every crowd isn't there? That lady DOES sound like a "bi-atch!!!" There is a store in downtown Royal Oak that had a cat, and I LOVED to go in there, just to pet that cat! Now, the store has grown, and the cat stays home...darnit! I want this book! And Caren, both of my dad's and mom's families are from New York and New Jersey...you and I have a lot in common! Yep! You are like me! OMG I love that your family is from the East Coast too and YES we DO have a lot in common! We HAVE to get together one day! awww but it's nice the kitty still has a nice home! I hope you do get this book! Thank you for your support! Love that your family is from NY! Thank you!! Yes! It is! Love this love the review and so hope you check out the book!! I was thinking the same thing!! Why didn't I think of a book like that! Yessssss do get it!!!! Thanks for the support! Makes a great gift too! Yay!!! So excited for Tamar! I can't wait to get a copy. It's on my Christmas list! This looks like a great book. Yes how cool would that be!! 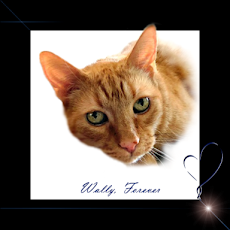 Thanks for the support and share with your kitty loving friends!!! What a fun idea for a book. I love it when I go in a store to find a resident cat! Clearly I agree! LOL! Caren did such a lovely job I'm so terribly flattered! The book quality is really lovely! HarperCollins did an amazing job - I do you hope you check it out! It also makes a lovely gift! Thank you! I love cats and ... New York. I have been there several times. Last one was ... a long time ago. The cover picture is a real good one. I've been very curious about this book. I've never been to New York, but it's one of those mystical places that I really want to visit in the future. you would LOVE New York...but...you had better go soon while it's still here. Yes!!! Get the books and take a virtual trip and she can visit the kitties when she comes!!! Thanks for the support! Fashion Friday : Cowboys and bunnies. Friday Flashback - Tree Climbers Part 1 and 2. Happy Easter Wishes From the Zee and Zoey Gang!